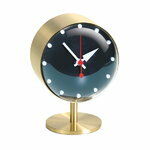 Vitra’s Night Clock is one of the table clocks that George Nelson designed for the American clock manufacturer Howard Miller between in the mid-20th century. Nelson’s mission was to add more modern design to ordinary American homes, and he succeeded in a brilliant way. The Night Clock attracts the eye with a combination of shiny brass and playful clock-face, and it is equipped with high-quality quartz movements.